…Dr Ishii started his career with an MD from Keio University School of Medicine, and a PhD in gastroenterology and hepatology from Keio University. He then pursued his postdoctoral training with Dr Charles S. Lieber at Bronx VA Medical Center and at Mount Sinai School of Medicine in New York City, during this time, where he began his deep involvement in his lifelong research theme alcohol-mediated liver and pancreatic disease, under his tutelage. Dr Ishii, in collaboration with Dr. Lieber, clarified the role of a new microsomal pathway of ethanol metabolism, then known as microsomal ethanol oxidizing sysytem (MEOS) (now accepted as cytochrome P450 [CYP]2E1). Dr Ishii proved biochemically and immunohistochemically that chronic alcohol consumption stimulated adaptive proliferation of the smooth endoplasmic reticulum in hepatocytes, and this increases metabolism of ethanol and other drugs, thereby explaining both tolerance to ethanol and increased hepatotoxicity of various drugs, anesthetics, and carcinogens. Several important medications, such as anticoagulants and sedatives, show decreased effectiveness in alcoholics because of this increased microsomal CYP2E1 activity. This remarkable finding is a fine tribute to his work as an investigator. Dr. Helmut Seitz was awarded the first Dr. Hiromasa Ishii Memorial Award Presenting the plaque to Dr. Seitz is Dr. Katsuya Maruyama. 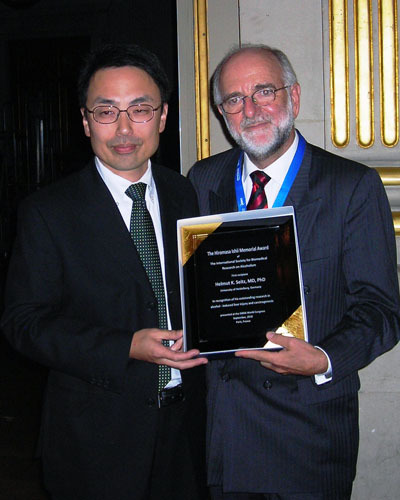 ISBRA commemorates Dr. Ishii's life and career by presenting an award in his name every two years at the ISBRA Congress.